An 83-year-old North Salem woman with ties to Putnam County was found dead Monday in her North Salem estate and State Police have called the death murder. Lois Colley, a long-time member of the Brewster- Carmel Garden Club, died from blunt force tra… Please login below or purchase a subscription to the Putnam County Courier to access this content. Nick Tallarico, a hunting proponent, residing in western Putnam, makes a point at Monday’s meeting. 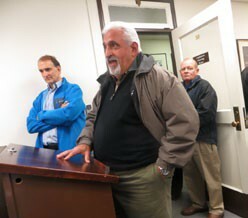 Dozens of hunters from across the county packed Monday’s meeting of the Putnam Legislature’s Protective Services Committee to protes… Please login below or purchase a subscription to the Putnam County Courier to access this content. Robert Palmer and Ryan Lepore are honored at the ceremony in Carmel. 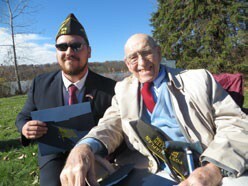 Putnam’s oldest veteran and one of the county’s youngest vets were recognized Monday, when Putnam County’s Row of Honor was unfurled along the Lake Gleneida shoreline. T… Please login below or purchase a subscription to the Putnam County Courier to access this content. Volunteers donating their time and talent while assisting the Dispute Resolution Center of Putnam County were honored last week at a dinner held at the Carriage House in Mahopac. Program Director Hans Schlange and Donna Ramlow, executive director of… Please login below or purchase a subscription to the Putnam County Courier to access this content. A 13-year-old Mahopac boy was seriously injured Sunday when he accidentally shot himself with an arrow while attempting to dislodge a crossbow. Carmel Police, Mahopac Falls FD Rescue Squad personnel and a paramedic from the TransCare Ambulance Compa… Please login below or purchase a subscription to the Putnam County Courier to access this content. 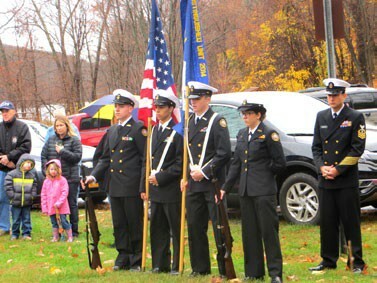 The Putnam Chapter of the Daughters of the American Revolution has come to the assistance of the Putnam Community Action Program, known as CAP. A toiletry drive was held earlier this month resulting in the collection of several laundry baskets full … Please login below or purchase a subscription to the Putnam County Courier to access this content. Family and friends are mourning the passing of James “Brad” McGee, this week. The 57-year-old entrepreneur and resident of Rye, New Hampshire, who graduated from Carmel High School in 1976, died last Wednesday when his single-engine pla… Please login below or purchase a subscription to the Putnam County Courier to access this content. Next time you run across Putnam 9-1-1 Dispatcher Brian Burdick call him “doc!” The 10-year-veteran employee of the county’s Bureau of Emergency Services helped to deliver his fourth baby this week by providing instructions over the… Please login below or purchase a subscription to the Putnam County Courier to access this content. Jody Sayler Join the Putnam History Museum for the 57th annual Thanksgiving service and dinner on Sunday, November 22, in Garrison. Jody Sayler will be honored at the dinner with the Elizabeth Todd Healy Volunteer Service Award. Over the past ten yea… Please login below or purchase a subscription to the Putnam County Courier to access this content.